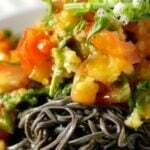 ½ zucchini spiralized into "noodles"
Start by boiling a big pot of water for your black bean spaghetti. Once boiled, add the Explore Cuisine Black Bean Spaghetti and let cook for 6 minutes. Once done, remove from heat, rinse under cool water and set aside. Prep your veggies! Finely dice your cucumber, bell pepper, mash your avocado, spiralize your zucchini. Next, add a spicy adobo chipotle sauce to your noodles and zucchini noodles. Combine the ancho and guajillo chiles in a large bowl and add plenty of cold water to cover. Let them soak until soft, about 30 minutes. Place the soaked chiles in a blender along with the ginger, cumin, salt, and pepper. Blend until very smooth. Stop the motor a few times to scrape down the sides with a spatula and give things a stir, just to make sure everything's getting puréed. Don't be tempted to add liquid—you want the final sauce to be thick. Scrape the purée into a small bowl if you plan to use it soon, or into a jar with a tightfitting lid if you want to save it for later. It'll keep in the fridge for up to 5 days, or in the freezer for 3 months. Add a few handfuls of baby spinach to a large bowl. Add some noodles, guacamole, then add cucumber, red bell pepper, vegan cheese, pumpkin seeds, and freshly chopped dill!